Business events provide a mechanism that lets external systems receive notifications from Microsoft Dynamics 365 for Finance and Operations. In this way, the systems can perform business actions in response to the business events. Business events occur when a business process is run. During a business process, users who participate in it perform business actions to complete the tasks that make up the business process. In Finance and Operations, a business action that a user performs can be either a workflow action or a non-workflow action. Approval of a purchase requisition is an example of a workflow action, whereas confirmation of a purchase order is an example of a non-workflow action. Both types of actions can generate business events that external systems can use in integration and notification scenarios. Business events must not be considered a mechanism for exporting data out of Finance and Operations. By definition, business events are supposed to be lightweight and nimble. They aren't intended to carry large payloads to fulfill data export scenarios. In Finance and Operations, business events are implemented in some business processes out of the box. These business events include both workflow and non-workflow business events. For more information, see Application business events, Workflow business events, and Alerts as business events. A developer must use extensions to implement new business events. For more information, see Business events developer documentation. The business events catalog can be accessed from System administration > Set up > Business events. The business event catalog lists the business events that are available in the instance of Finance and Operations that you're using. The catalog is useful because it shows which business events are available, and you can filter it by category, business event ID, and name. The category of a business event identifies its source in Finance and Operations. Business events that originate from the workflow system are assigned to the Workflow category. For business events that originate from other modules, the module name is used as the category name. The business event catalog is built during database synchronization at the time of deployment. Therefore, users should see the complete list of business events in the catalog. However, if an explicit update of the catalog is required, you can select Manage > Rebuild business events catalog. For each business event, the business event catalog shows a description. This description can help you better understand the business event and its context in the business process. The catalog also shows the list of data fields that will be sent out in the event. In summary, the business event catalog helps identify the business events that are required for an implementation. It also helps identify the schema for each business event. The next step is to manage the endpoints. To process the business events, the business events batch processing job must be scheduled in a recurring schedule like any batch job in Finance and Operations. The batch job can be accessed from System administration > Periodic tasks > Business events. Endpoints let you manage the destinations that Finance and Operations must send business events to. The following types of endpoints are currently supported. Therefore, endpoints can be created for these messaging and event brokers out of the box. Some scenarios might require multiple endpoints for organized distribution of business events to consumers. You can create multiple endpoints to support these scenarios. The Azure-based endpoints must be in the customer's Azure subscription. For example, if Event Grid is used as an endpoint, the endpoint must be in the customer's Azure subscription. Finance and Operations doesn't provision the endpoints. It just sends events to the endpoints that are provided. Customer might incur additional costs if they use these endpoints in their Azure subscription. To create a new endpoint, select New. Then, in the Endpoint type field, select the appropriate endpoint type. To create an endpoint to a Service Bus queue, select Azure Service Bus Queue. Select Next, and specify the name of the endpoint and the Service Bus queue. In addition, you must set up Azure Key Vault to provide the secret to the Azure messaging resource. You must also set up the Azure Active Directory (Azure AD) application ID and application secret. In the Queue Name field, enter the Azure Service Bus Queue name that you created in the Azure Service Bus Queue configuration in Azure. In the Azure Active Directory application ID field, enter the application ID that is created in Azure AD in the Azure portal. In the Azure application secret field, enter the secret value for the application. In the Key vault DNS name field, enter the name from your Key Vault setup. In the Key vault secret name field, enter the secret name for the endpoint resource that must be created in Key Vault. 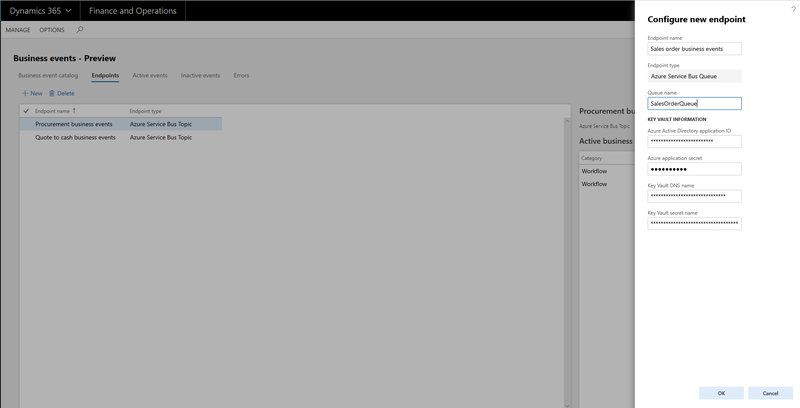 The Key Vault Secret value, in Azure, will be the Azure Service Bus Primary Connection String value. This value is found in the Azure Service Bus that you configured in Shared Access Policies > RootManagedSharedAccessKey. The Azure application that was registered must be also added to the Key Vault set up under Access policies in the Key Vault. For this setup to be complete, select the Key, Secret & Certificate Management template and then select the application as the principal. To create an endpoint to a Service Bus topic, select New, and then, in the Endpoint type field, select Azure Service Bus Topic. The Topic name field must be set to the name of the Service Bus topic. Key Vault information is set up in the same way that it is set up for an Azure Service Bus Queue endpoint. To create an endpoint, you need to create and configure an Azure Event Grid Topic in Azure Portal, and then create an endpoint to the Event Grid Topic in the Business Events Workspace. Go to the Endpoints tab, select New, and then select Azure Event Grid as the Endpoint type. In the Endpoint URL field, enter the URL from the Azure Event Grid Topic. This is the Topic Endpoint value in the Overview section of your Event Grid Topic. Key Vault information is set up in the same way that it is set up for an Azure Service Bus Queue endpoint, except the Key Vault secret should now point to the Event Grid credential, rather than the Service Bus connection string. The Event Grid Credential can be found under the Event Grid you created in the Access Keys section under Settings. After you've created the endpoints that you require, the next step is to activate the business events. Business events in the business event catalog aren't active by default. From the catalog, you can activate any business events that you require. Select one or more business events, and then select Activate. Business events can be activated either in all legal entities or in specific legal entities. If you leave the Legal entity field blank, the selected business events will be activated in all legal entities. If a business event is required only for specific legal entities, it must be configured separately for each legal entity. Endpoints must be assigned to the business events that are activated. When business events occur as business processes are run, the system will do outbound processing only for business events that have been activated. After business events are activated, they appear on the Active events tab. From the Active events tab, you can inactivate business events. The system won't do outbound processing for inactivated events. After business events are inactivated, they appear on the Inactive events tab. Business events can be inactivated when processing of business events must be paused for a period because of specific system maintenance activities in the integration landscape. When business requirements change, some business events might no longer be required. In this case, you can inactivate them instead of deleting them from the list of active events. This approach is useful if the history of errors for the business events must be preserved. Inactivated business events can be deleted later, when there is no longer a business need to keep them inactivated. While the system does outbound processing of business events, errors can occur. These errors might prevent the system from successfully delivering a business event to the endpoint. If an error occurs, the system retries several times to successfully process the business event. However, if all attempts are unsuccessful, the business event is saved in an error log. Error logs can be accessed from the Active events, Inactive events, and Errors tabs. The Errors tab shows all errors across all business events, whereas the other two tabs show errors in the context of a specific business event. 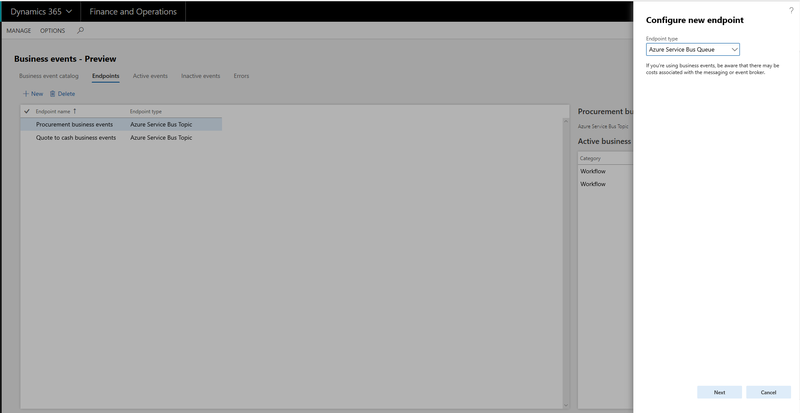 You can do on-demand outbound processing on each error by using the Resend action. This action invokes the outbound processing logic. This logic includes retries. If the outbound processing is still unsuccessful, the error is logged in the error log. In this case, the Last process time field on the Errors tab indicates when the last attempt to process the event occurred. If an error can't be successfully processed, you can use the Download payload option to download the payload from the event for offline processing, as you require. If an endpoint is deleted and a new endpoint is associated with business events, all errors that are associated with the business events can still be resent. In this case, the system will do outbound processing to send to the new endpoint that is associated with the corresponding business event. This functionality allows for graceful recovery from misconfiguration or other error states. Business events can be consumed using Microsoft Flow, Service Bus, Event Grid, or other endpoint types. Customers must bring their own subscriptions to use Microsoft Flow, Service Bus, Event Grid, or other endpoint types. A business event can be activated in all legal entities or in specific legal entities. A business event can be sent to a unique endpoint or the same endpoints. 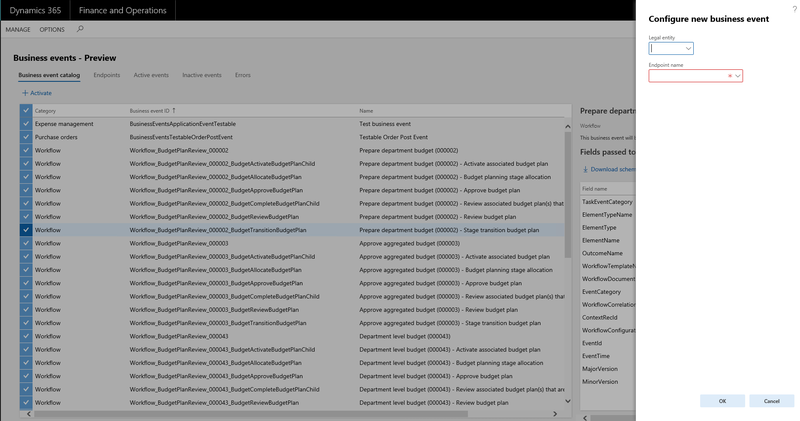 Microsoft Flow can directly subscribe to business events. Business events enable idempotent behavior on the consuming side by having a control number in the payload. The control number is an upwardly increasing number, which can be tracked by the consuming application to detect duplication and/or out of order delivery. The control number cannot be misread as the sequence number because the control number cannot be sequential. There can be gaps in the numbering space. Azure Service Bus and Azure Event Grid supports subscribing to topics by specifying criteria on the incoming message. For more information, see Topic filters and actions and Understand event filtering for Event Grid subscriptions. A business event that is sent to an Azure Service Bus or Azure Event Grid has the following fields made available for this purpose. Subscribers can use this information to subscribe to more specific topics as required. Category – This is the business event category as displayed in the business event catalog. This is useful as a filter criterion when a common topic is used for receiving business events from multiple categories and subscribers want to only receive business events for the category that they are interested in. Business event ID – This is the class name of the business event implementation as displayed in the business event catalog. This uniquely identifies the business event (not the instance of the business event) and thus helps in validation of received business events on the consumer side to ensure the expected business event is what is being received and processed. Legal entity – This is the legal entity in which the business event happened. This is a useful information to base the consuming logic on if the processing and distribution of business events on the consumption side must be driven by a legal entity. The filterable fields that are sent in a business event can be modified to include custom fields. This is a developer experience.